Luxurious duplex apartment refurbished in 2017 located in an historic building across from the Palais des Papes. The access is Place du Palais but the apartment is quiet since totally overlooking one of the famous secret gardens of the town. The apartment has a surface area of approximately 63 sq.m. and consists of a first floor with living room and open-plan equipped kitchen and a second level with a 20 sq.m bedroom with 2 twin beds 80 cm large ( or a double : 160 cm x 200 cm ) and a small adjacent bedroom with 2 twin beds 70 cm x 190 cm ( or a double 140 cm x 190 cm ). This bedroom is better for teen agers or a couple for a short stay since not very big. Between the 2 levels, bathroom consisting of tube, real shower and toilets. WiFi, TV, and CD player/radio in the living room. You will find modern furniture, vintage pieces and artwork. An underground toll park space is at 30 meters. Price : 19 Euros per day or 40 Euros for a week. If you stay more than 2 days, it is cheaper to take the week rate ticket. I am passionate about history and literature, and I have been living in Provence for 5 years now. I love travelling and meeting new people. to give the same advantages I benefit when I travel with Homelidays. 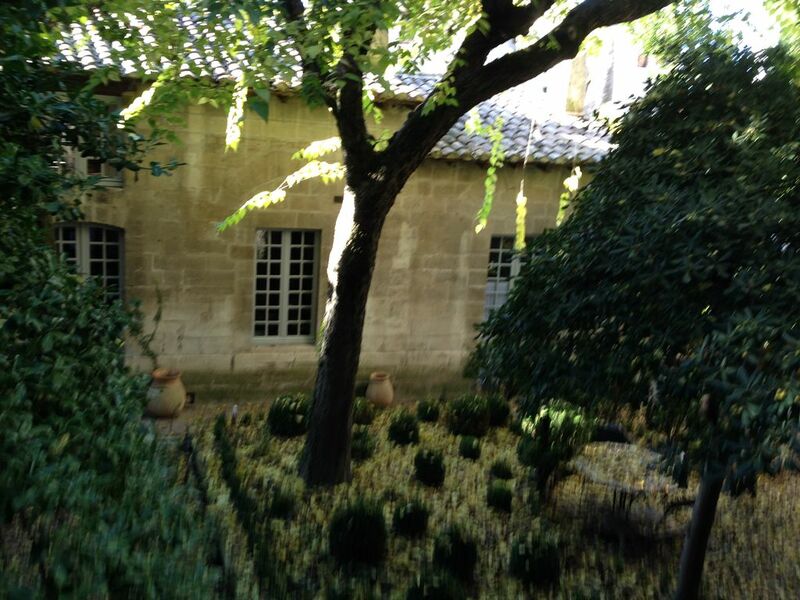 The location: in front of the Palace of the Popes, in the heart of Avignon and very quiet. The comfort and style of decoration: a mixture of collectibles, modern and vintage furniture. Full bathroom with bathtub and walk-in shower. We had a wonderful stay in Alain's apartment. Loved the location and the apartment. Alain was a fantastic host and very helpful. Highly recommend. Perfect location. Epic front row view of the Palais de Pape at the entrance to the building, quiet, beautiful garden oasis in the back. Character building but with all the modern conveniences. Took a great 5 hour tour to Nimes and Uzses and will be back again. We absolutely loved the location (we really cannot imagine a better location!) and the amenities! Alain was very responsive in emails and so helpful in person. There is no a/c and we happened to visit on two of hottest days of summer- so we did have a difficult time sleeping. I didn’t mark down the place based on that though- as there were portable fans that helped a bit. We highly recommend this apartment. Great apartment to come back to after a day of exploring. Very peaceful. We had a lovely stay in Alain’s apartment. It looks out on a peaceful courtyard that was a delight to come home to sit and relax in on a warm afternoon. Well appointed with all we needed for our stay. It’s amazing to step out on to the Palace of the Popes in the evening and see the buildings lit against the night sky. Anyone who is looking for a cozy spot to relax in will not be disappointed. The apartment is a hidden gem right on the Place Des Papes. It is in an historic building and well equipped The view on to the shaded garden, complete with resident cat, is sublime and very peaceful. Alain, the owner, is very hospitable and helpful. All the main sights, museums, shops and restaurants are very close by, and the Avignon Central station is a short walk away. Highly recommended. Caution de 150 euros Une semaine minimum pendant le Festival d'Avignon.